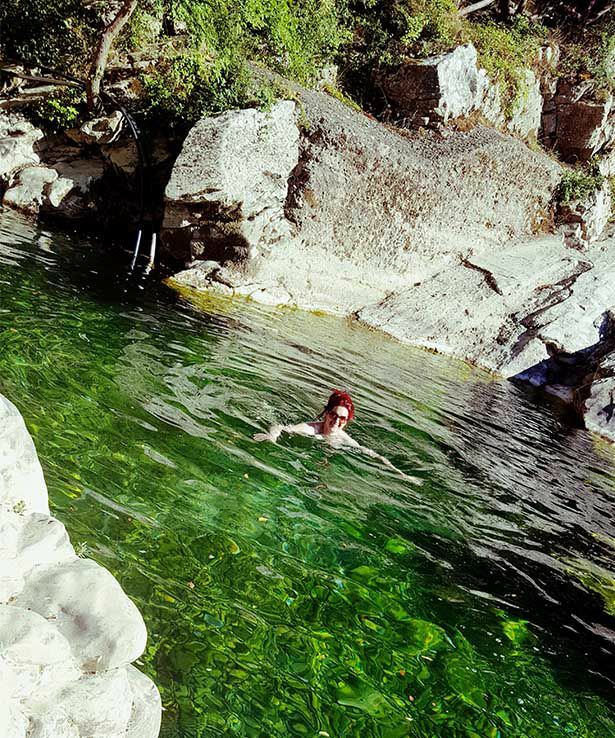 We sent intrepid traveller Lois Pryce to Italy’s Cilento region. 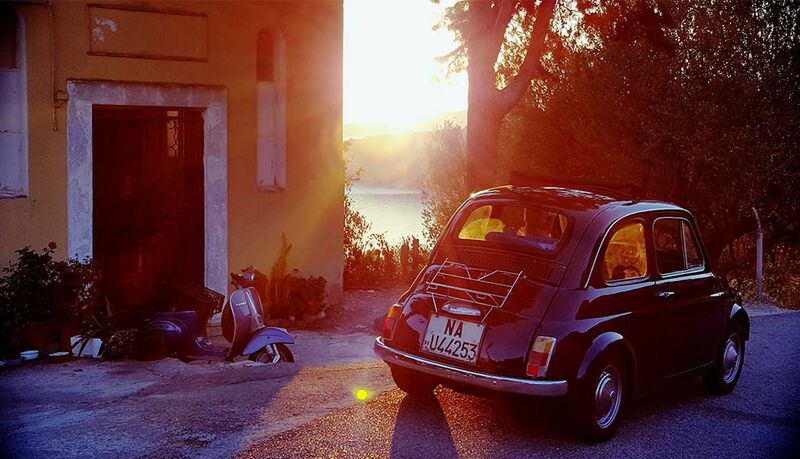 Lois has motorcycled her way around the world, but for this Journey we channeled some authentic Italian spirit and sent her off in a vintage Fiat 500. 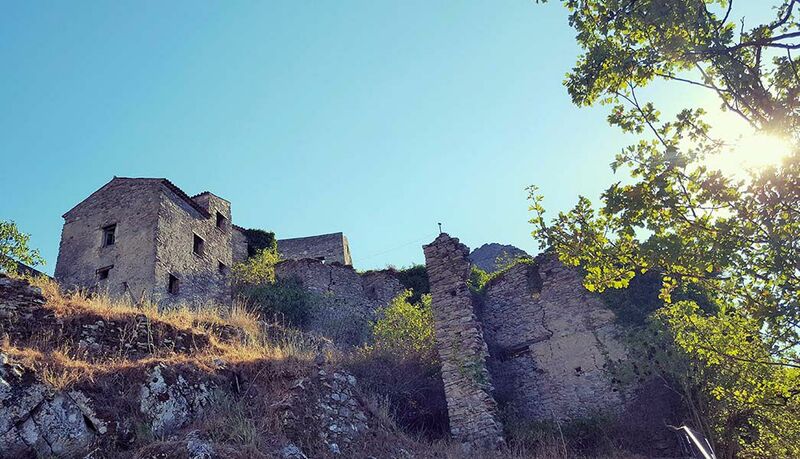 Follow her journey through the unmanicured wilderness of the charming Cilento coast. Lois Pryce was bitten by the adventure bug at the age of 13 on a week-long, parent-free bike ride round Cornwall. Since then she has graduated to motorbikes and set off on epic treks including a ride from Alaska to Argentina, a 10,000 mile round trip in Africa and two years biking in Iran to research her third book, Revolutionary Ride. We sent her to Cilento, on Italy’s west coast, where fierce opposition to development has created an area of classic, unspoiled beauty. Her companion, in the place of her usual bike, was a vintage Fiat 500, which was greeted with nostalgic affection by many of the local characters she met. ‘Everybody knows the cinquecento! Everybody love-a this car!’ says Sergio, giving the Fiat a fond pat on its curvy behind. Through the rear window I see a flake of rust come loose from the ceiling and land on the back seat. I find this strangely reassuring. I have a feeling the cinquecento and I are going to be friends. We are in Sorrento, high on a hill overlooking the Bay of Naples shimmering beneath Mount Vesuvius. Our mission: collect our wheels from Sergio’s vintage car rental base and hit the road. 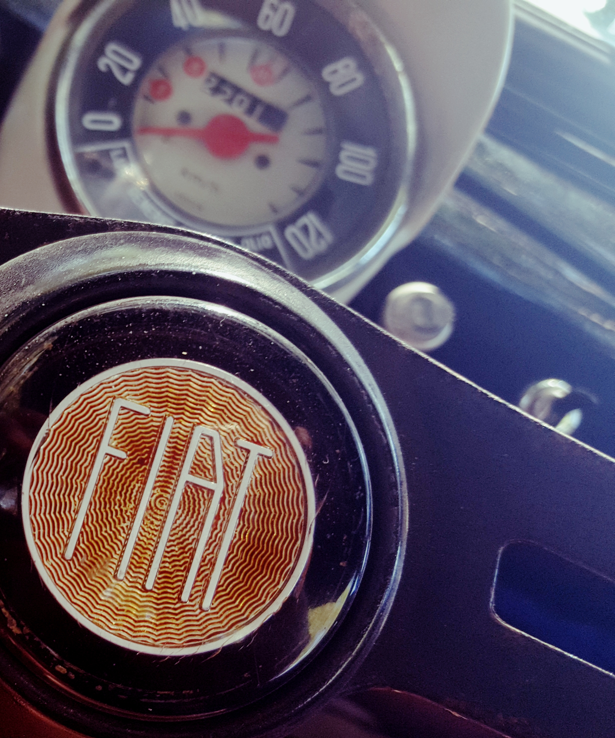 There are some immaculate Alfa Romeos tucked away in the garage but this unrestored 1965 ‘Cinquecento’ aka the Fiat 500 is the perfect vehicle for our road trip. Sorrento is the hub for the rightly famous Amalfi Coast but we are heading further south into Italy’s lesser-known, wilder region of Cilento. With no air-con, fuel gauge, radio or even seatbelts, there is very little briefing required. Just turn the key, pull a lever to start, give it a bit of throttle… and the 500cc engine rumbles into life. Windows down, sunroof open and we’re off! We nip and squeeze through Sorrento’s crowded streets where hordes of American tourists tramp the lava pavements, pausing only to check their Fitbit readings. We soon leave them and the choked corniche of Amalfi behind, and as the road opens up, the tiny Fiat comes into its own as a magical time-travel machine. We soon leave them and the choked corniche of Amalfi behind, and as the road opens up, the tiny Fiat comes into its own as a magical time-travel machine. Our first detour into the past pre-dates even the birth of the Fiat. 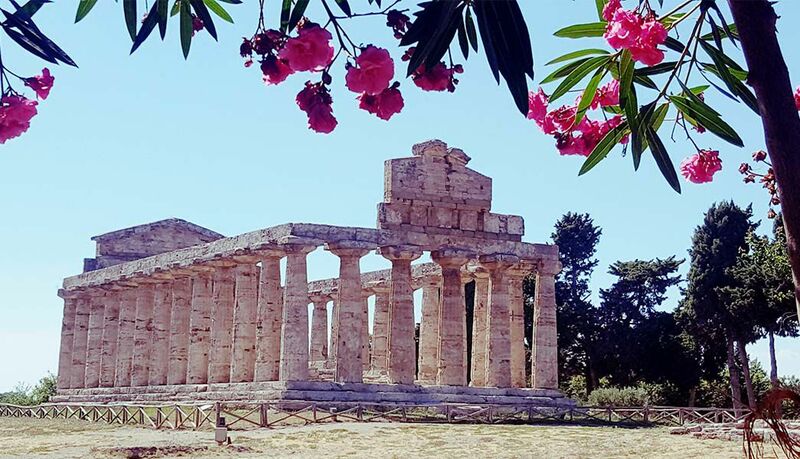 We are transported all the way back to 450BC, to the ancient Greek temples of Paestum on the Tyrrhenian coast. Set in pleasingly untamed grounds with just a few low-key gelaterias nearby, the serene atmosphere is a world away from Europe’s more famous ancient sites. There are no crowds or queues for tickets but the amphitheatre, city walls and temples with their great Doric columns are among the best preserved in the world. 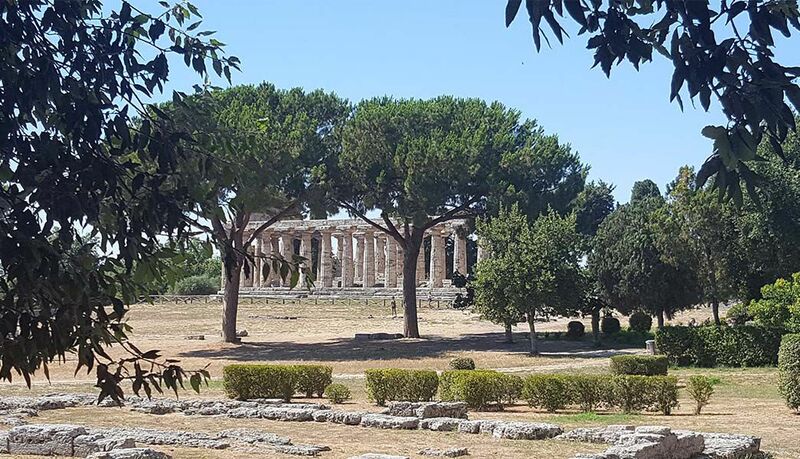 It is in Paestum’s old town that we have our first taste of the cinquecento effect. Old men passing time at roadside cafes stand to wave, eyes alight with nostalgia. Young men waive our car park charges. 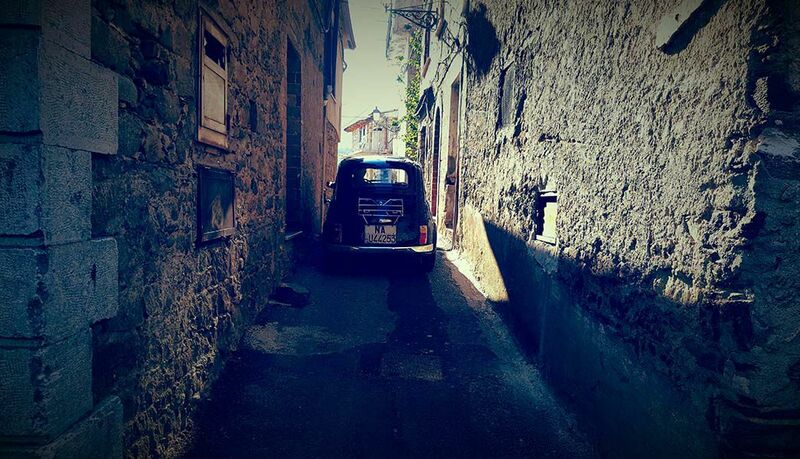 Strangers stop to guess the car’s vintage – ‘Mille novecento sessantacinque, si?’ – sharing their own cinquecento stories. Launched in a state of post-WW2 deprivation, with a retail price equivalent to 270 Euros, this was the car that got Italians on the road and cemented a national passion for motoring. Our trip coincides with the cinquecento’s 60th anniversary and the newspapers are full of affectionate headlines celebrating la machina piu amata degli Italiani – ‘the most beloved Italian car’. 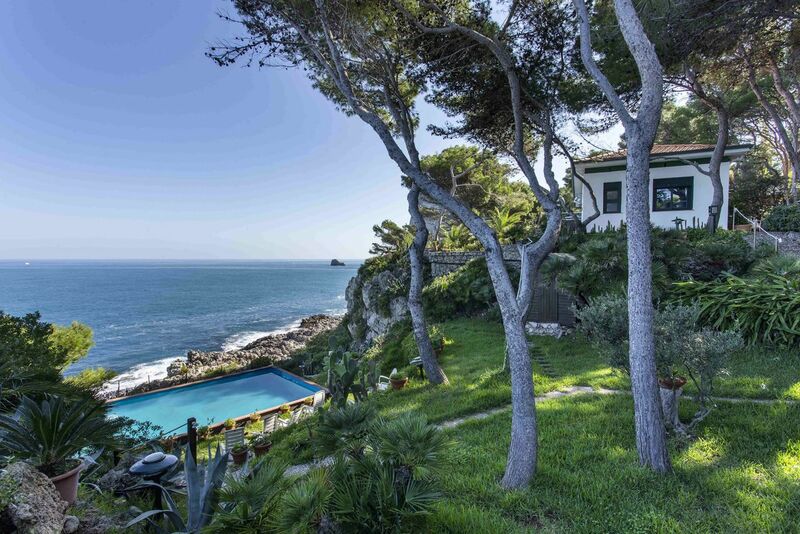 Our route is a wild-swimmer’s dream, with fresh and salt water options at every turn. 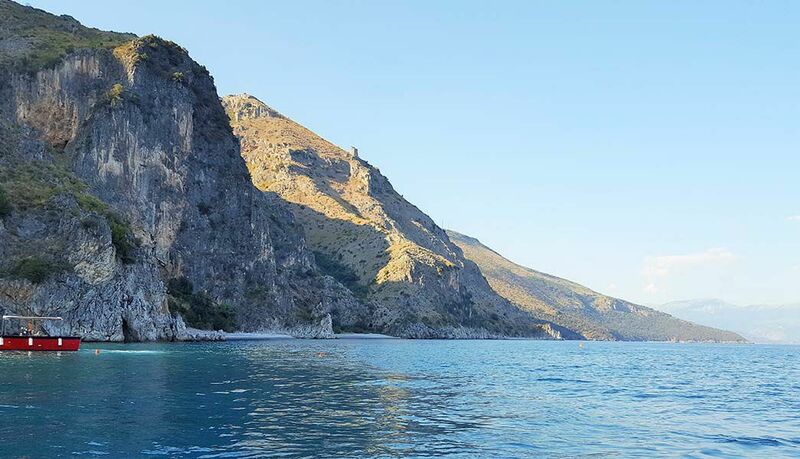 We loosely follow the coast with its glittering turquoise sea to our right, taking occasional detours into the hinterland where deep gorges slice through the mountains, providing much-needed cooling-off opportunities in glassy green rivers. Along the way sun-bleached terracotta villages teeter on improbably steep mountainsides, giving glimpses into a world that appears unchanged for centuries – laundry flutters from wrought iron balconies, sleepy dogs pant in the shade and villagers sit on doorsteps chatting, with apparently no pressing engagements. The road hairpins through wild country, and Cilento transports us back to childhood holidays; there are no high-rise hotels or global coffee shop chains, the car smells of hot engine oil and our thighs stick to the vinyl seats. The land is an un-manicured wilderness of olive, lemon and orange trees, bamboo and pines, shot through with flashes of disco-pink bougainvillea, the odd rusting abandoned car, and potholes that keep the Fiat swerving in a truly Italian style. Everything about Cilento is charmingly, refreshingly unpretentious. But Italianos will never skimp on style, and chic accommodation and ristorantes serving fresh, locally sourced delicacies are plentiful. Perhaps it is in keeping with the old-school vibe that the car conks out on us. A clip on the throttle cable has sheared but fortunately, the engine is simplicity itself, and our breakdown occurs outside a shop that provides us with shoelaces and a bag of balloons which we use to make an emergency repair (yes, really) – and on we go. Somehow we love our cinquecento a little bit more now. At the southernmost point of Cilento, we meet Sebastiano, organic farmer, proprietor of the San Fantino vineyard and B&B, and all-round Cilento action man. 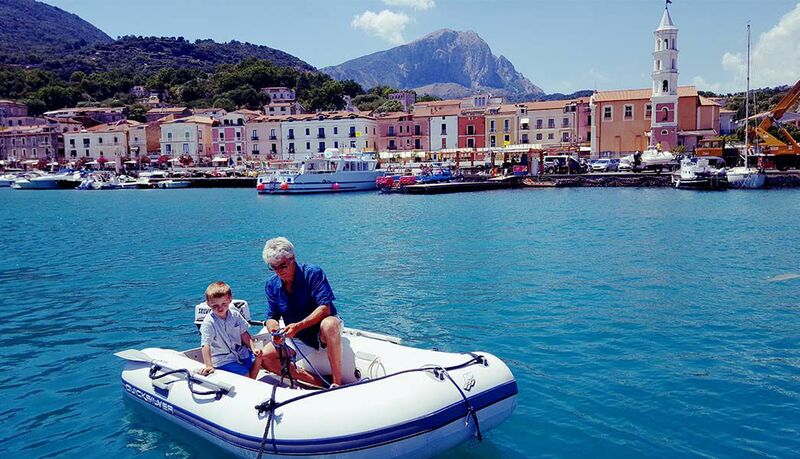 ‘The only way to see this coast is from the sea’, he insists, whisking us out of the pastel-painted harbour of Scario in a launch, following the longest strip of coastline in Italy without road access. Dotted along the bottom of the cliffs are secret coves and caves, accessible only by boat. 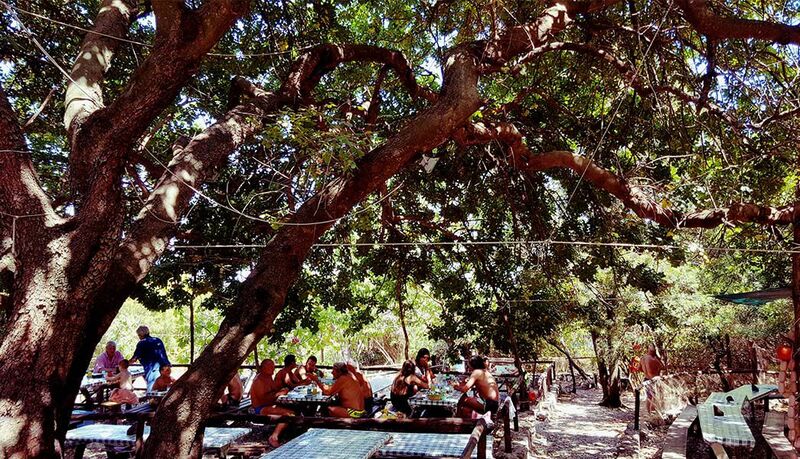 A public ferry service makes a daily round trip during the summer to Spaggia Marcellina where we drop anchor for a few hours to swim and it turns out, eat. 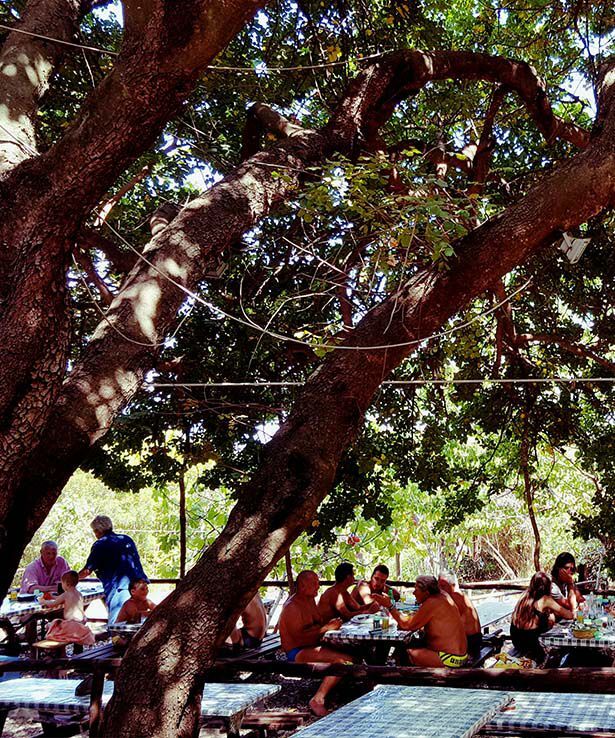 Secreted beyond the trees at the back of the beach is La Taverna del Lupo, a film set trattoria of red-checked table cloths and home-grown food served beneath the spreading shade of a 200-year old carob tree. Here Sebastiano introduces us to a Very Important Person – his mother. They call her ‘The Warrior of Cilento!’ said Sebastiano. We all raised a glass of San Fantino rosso to that. Sebastiano has dreams of Cilento becoming an artist’s colony, like Marrakech in the sixties, or Ibiza before it was over-run with ravers.